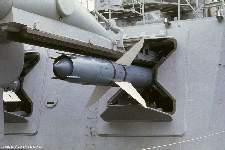 The Talos missile system was the reason that the USS Oklahoma City CLG-5 existed. 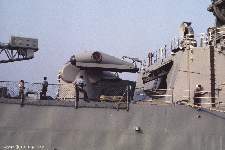 The ship was built during World War Two, one of 27 Cleveland Class light cruisers. 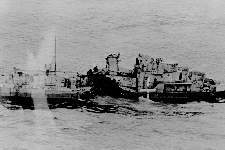 After the war most of these ships were scrapped. 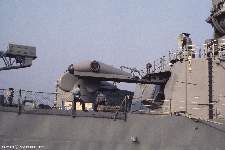 Six were selected to be converted to guided missile launching platforms to provide anti-aircraft protection for the fleet. The Okie Boat was one of them. 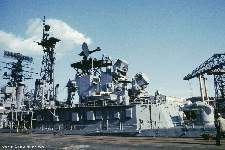 Everything on the original ship above the main deck aft of the smoke pipes was removed and replaced with the missile house and launcher. Inside the missile house was a missile stowage magazine, a ready service magazine holding 16 missiles ready to fire, an area just forward of the launcher where the wings and fins were attached before firing, and test cells where the missiles were serviced. 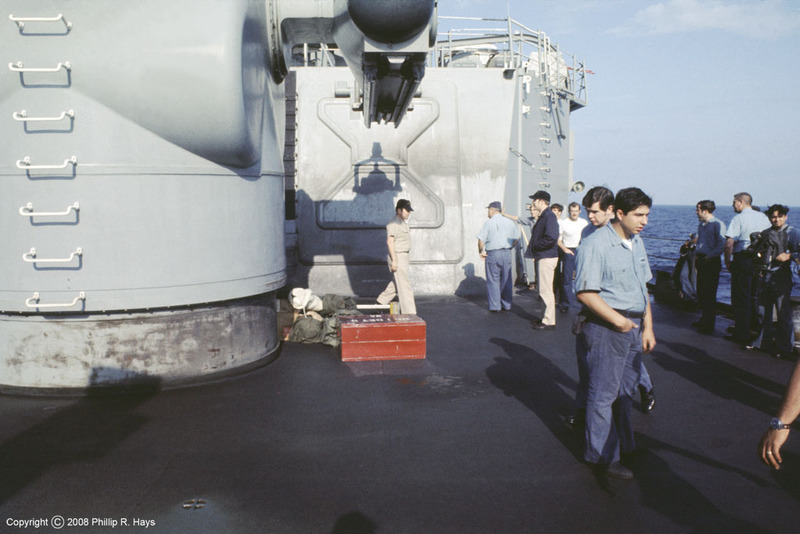 On top of the armored box of the missile house was a new superstructure and radar tower. This carried the target tracking radars, missile guidance antennas, and a long range air search radar. Inside the structure were radar rooms and Weapons Control where the missile system was operated. When we wanted to launch a missile heavy blast doors on the aft end of the missile house opened and the missiles were moved onto the launcher. Here is a sequence of pictures showing a TSAM (trainer surface to air missile) being run out on the rail (top left to lower right). 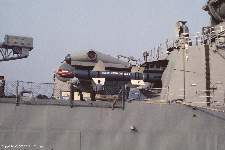 The Okie Boat logos on the launcher were attached only when we were having an open ship in port. First a watch was posted to keep someone from getting hurt. 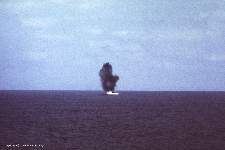 Then the lower blast door opened. 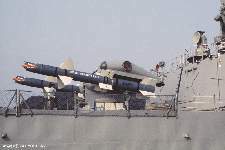 The upper door opened and the attached rail section mated with the rail on the launcher. While the blast doors were open we moved the display board out of the house. 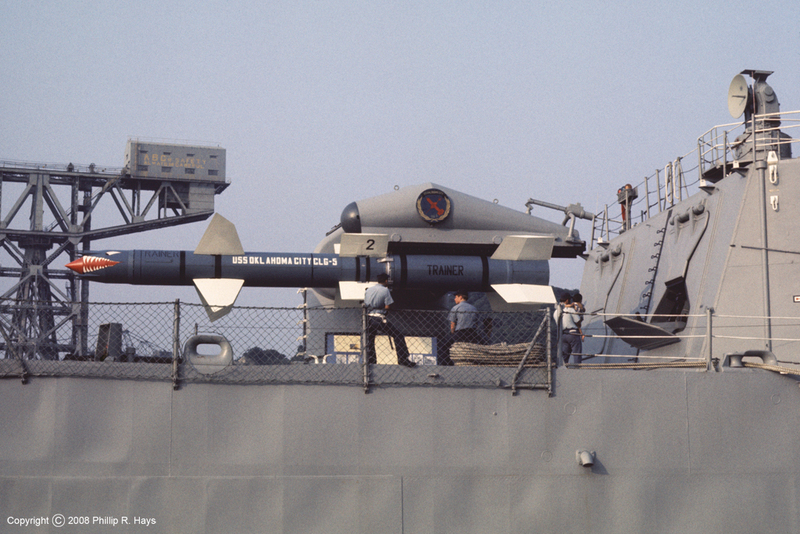 Then the missile came out and was latched in position on the launcher. The top door closed, followed by the bottom door. 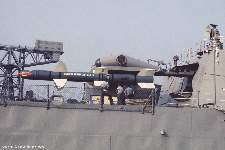 Then the launcher arms were rotated up to "display" position. 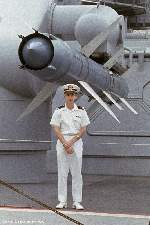 Here is another look, with a picture of yours truly standing below a missile for size reference. This was before the GM Division guys decided to get fancy and paint the shark's teeth on the birds. 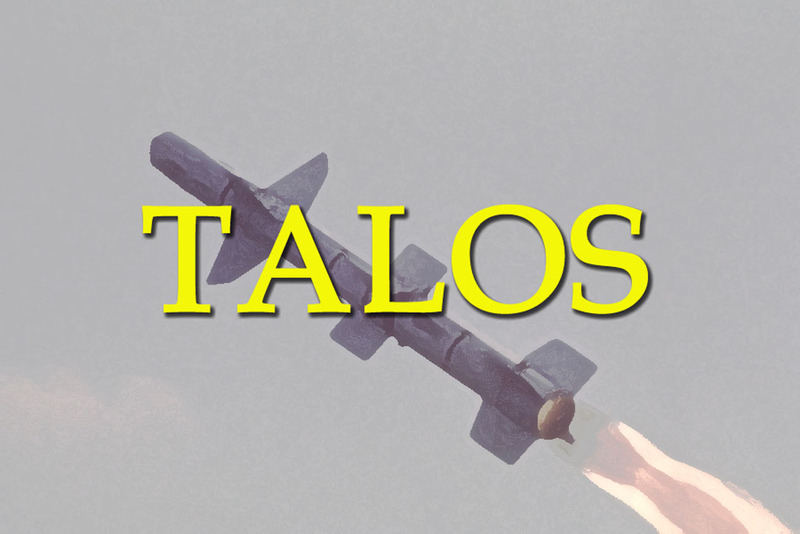 Talos was a big missile. 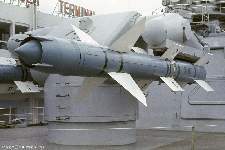 Missile and booster were about 32 feet long, only a foot shorter than the Soviet MiG 15 that it was designed to shoot down. 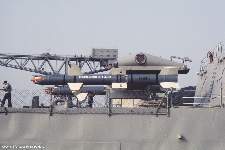 The missile battery was operated from Weapons Control. This space was manned when we were at General Quarters or Condition 2 AAW. Normally the overhead lights were off and illumination came from all the equipment. I took the right hand picture during the change of watch. 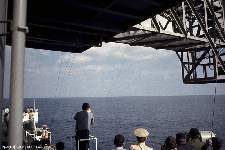 At the front of the space were two large radar repeaters - look closely and you will see the coast of North Vietnam on the bottom repeater. 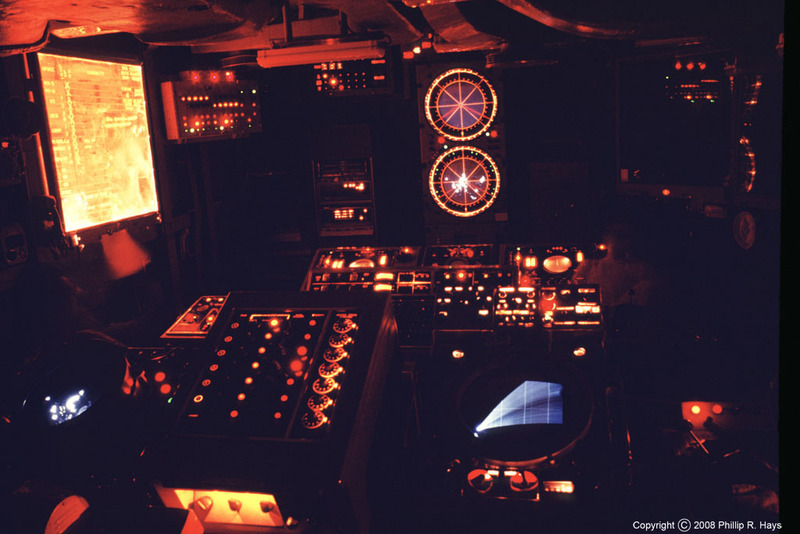 To the left was the PDP-8 computer used to calculate surface-to-surface guidance trajectories. 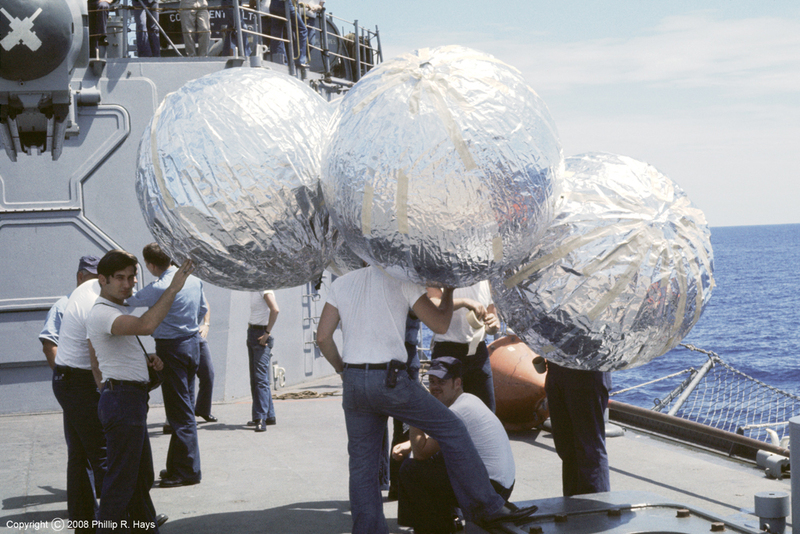 In front of the repeaters were the launch consoles where the missiles were fired. 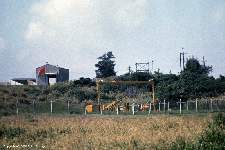 Behind that was a missile selection station that allowed a particular missile in the ready service magazine to be selected. 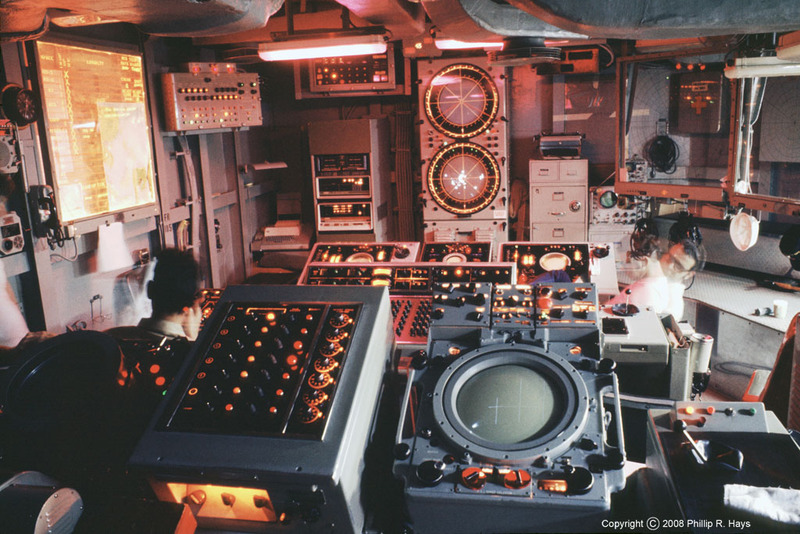 At the back of the room were a target designator console and a radar repeater that happened to be set to the SPW-30 altitude radar when these pictures were taken. Other displays showed target designations and weapons status. 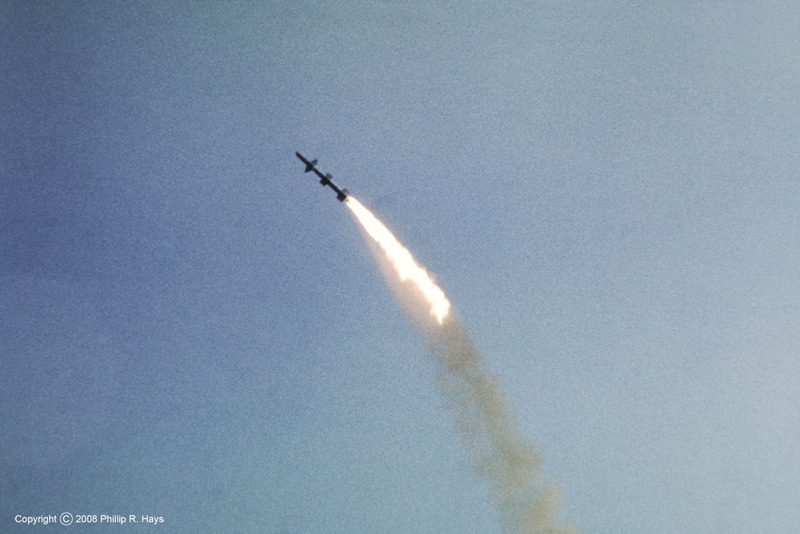 Here is a sequence of photos of a surface-to-air launch. 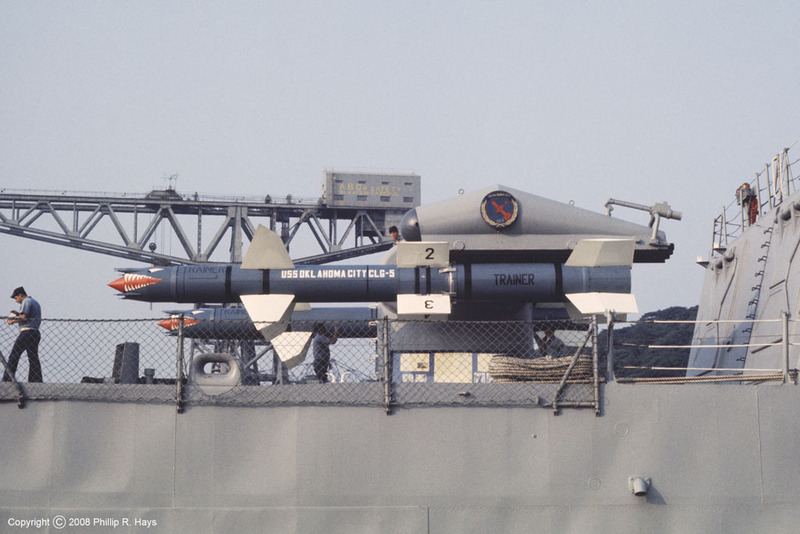 You can just see the white nose of the missile on the launcher - we weren't allowed to get closer than this, for good reason. 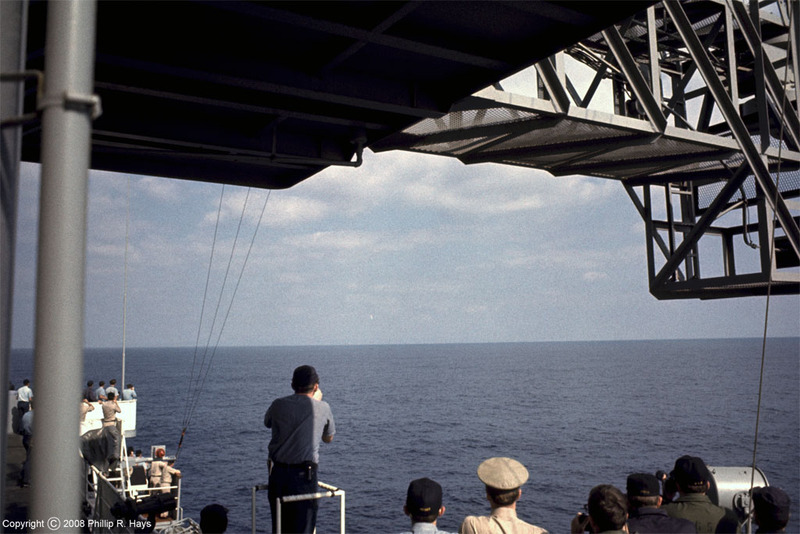 The countdown was announced on the ship's 1MC speakers, and when three, two, one, zero came there was a tremendous bang and suddenly the missile was a mile or two away. 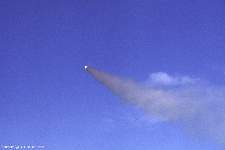 The missile accelerated to Mach 2.2 (about 1690 mph) in about six seconds at a distance of about eight miles from the launcher. It really left in a hurry! 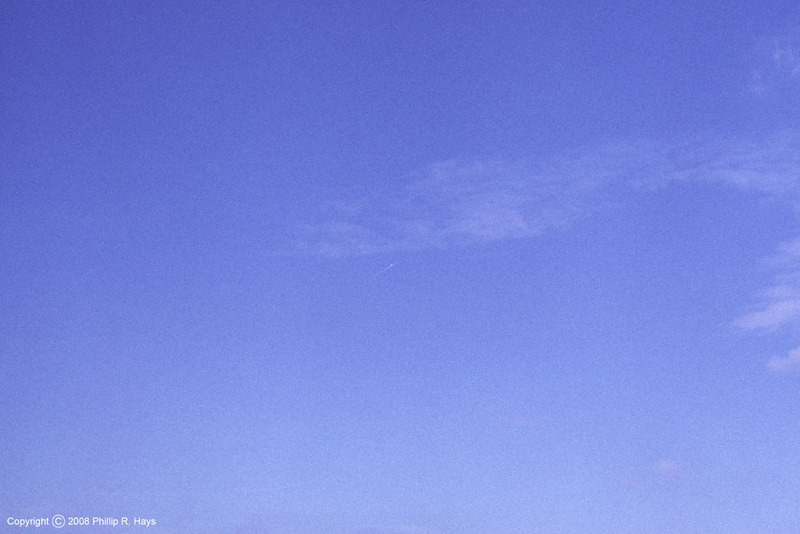 If you follow the pictures you can see what appears to be booster separation and finally a white puff at the end of the contrail. Not much to see really, but it was pretty exciting nevertheless! 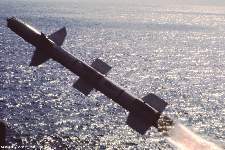 That is how missile shots were supposed to go, but one definitely did not go as planned. It left the rail normally and seemed to be running true. Then suddenly it turned around and came back! 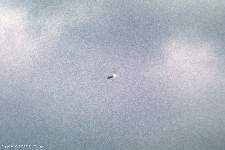 It curved up and looped back over the top, diving right at us. For a moment I was looking into the business end of the thing! Then it nosed down and made a sharp turn. Climbing again it flew by and headed away in front of the ship. 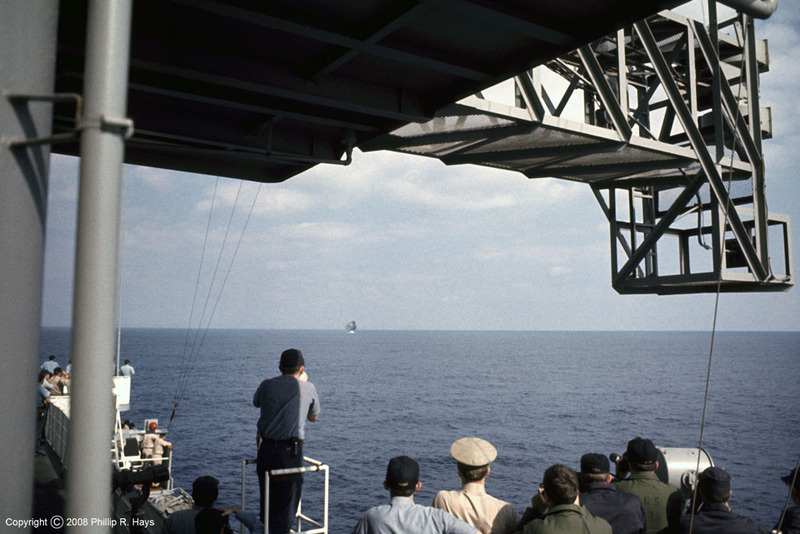 Here you see the bird making a tight turn almost directly over the ship. 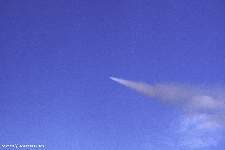 The enlargement above shows an asymmetrical flame coming out of the booster. It didn't accelerate to Mach 1 before the booster fuel ran out, so the booster and missile didn't separate. The enlargement to the lower left shows hot gasses still escaping from the spent booster as the missile falls. 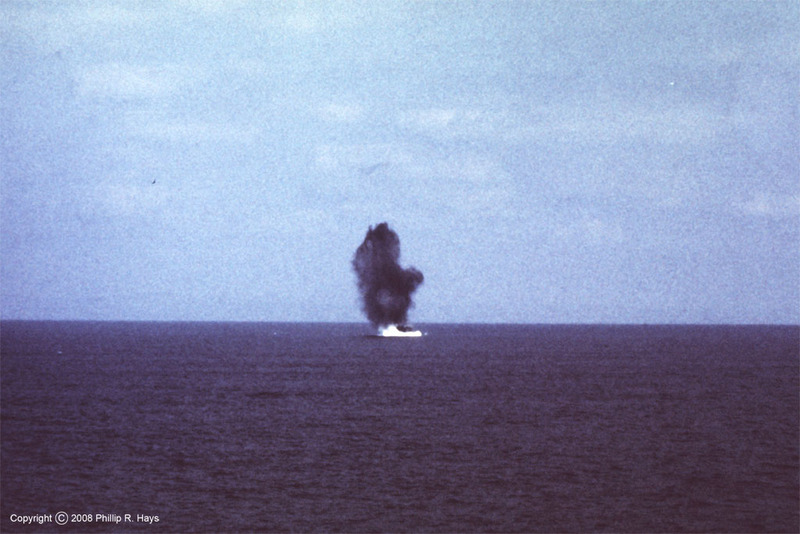 It came down about a mile or so in front of the ship and exploded when it hit the water. 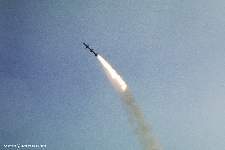 Look closely at the picture lower right and you can see pieces of the missile in the air and splashing into the ocean. That one was a bit more exciting than the ordinary shot! After a launch there was a lot of burned paint on and around the launcher. 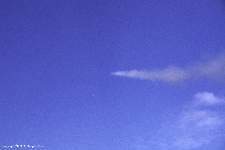 The booster was quite a blow torch with a flame 70 to 80 feet long. Here you see Third Division repainting the deck and rear of the missile house after a shot. 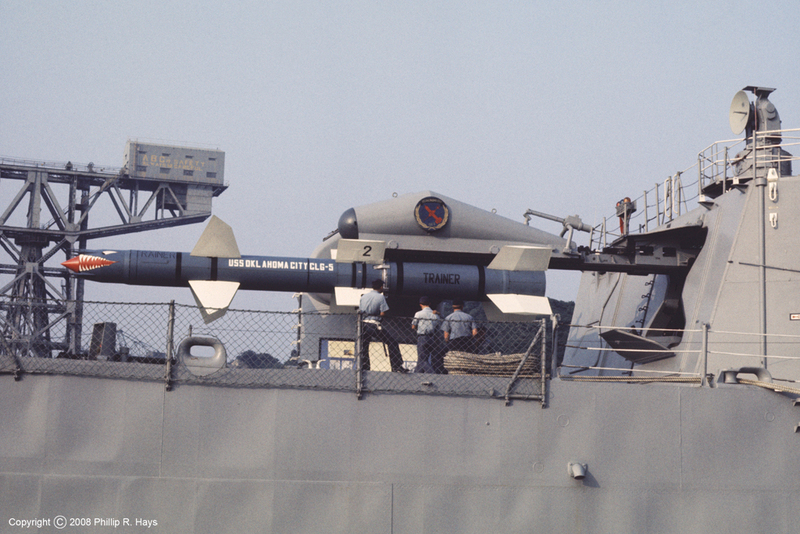 GM Division was responsible for launcher maintenance, and had already repainted the launcher. 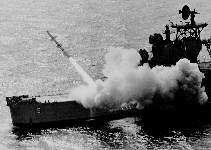 Most of our missile shots were training exercises in the missile range off Okinawa. 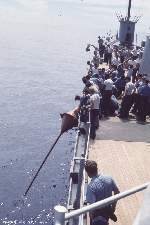 We fired training shots two or three times a year. I was walking along the beach in Okinawa one day when I passed the target drone launch site. A few minutes later there was a whoosh and a supersonic Firebee drone shot into the air. 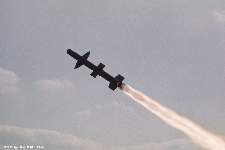 A fellow at the test range said most surface-to-air and air-to-air exercises resulted in near misses (the test missiles did not carry live warheads) and the drones were recovered. However, he said the Talos shots almost always resulted in skin to skin contact and the drone was destroyed. On one occasion we had to abort a shot because an airliner strayed into the launch zone. 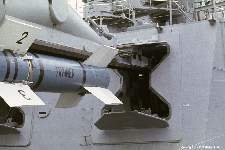 The target drone had already been launched so it circled until it ran out of fuel. 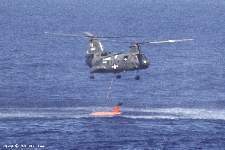 Then it popped a parachute and descended to the water. 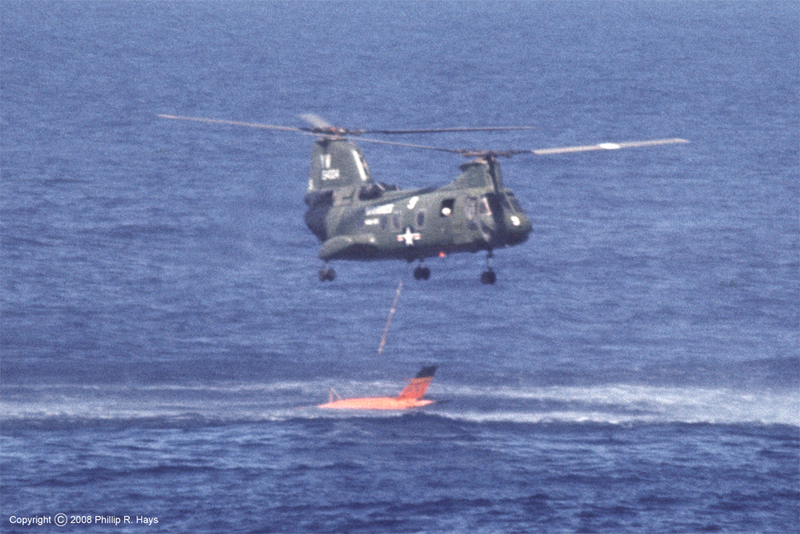 We steamed to where the drone splashed down and watched as a test range helicopter fished it out of the drink and carried it back to be used again. On one cruise we took aboard some special missiles. 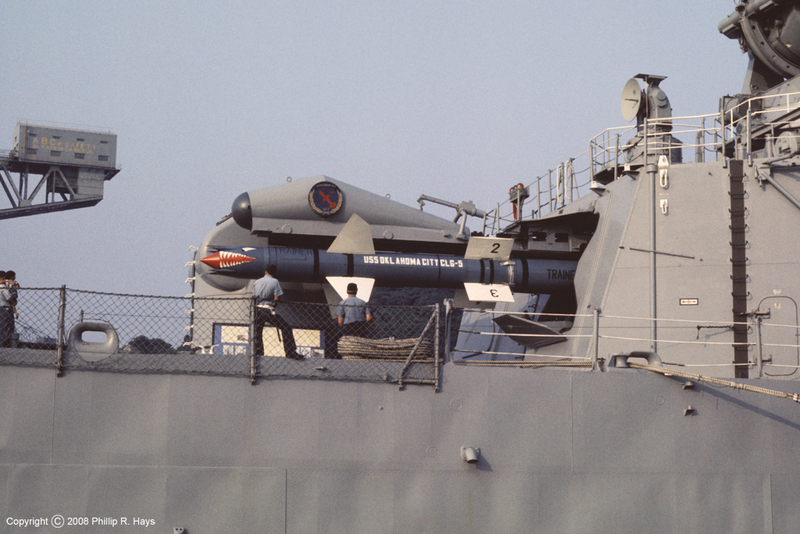 Only a few people on board knew about the secret RIM-8H anti-radiation missiles (ARM). 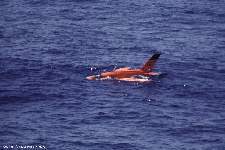 I didn't know anything about them until just before we took them aboard. 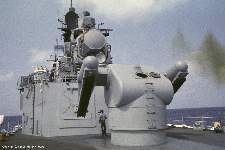 They were designed to seek out and destroy Russian radars. We steamed to the Okinawa test range for a practice exercise with the new birds. 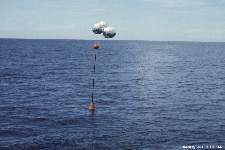 First we launched a target buoy with radar reflecting balloons attached. 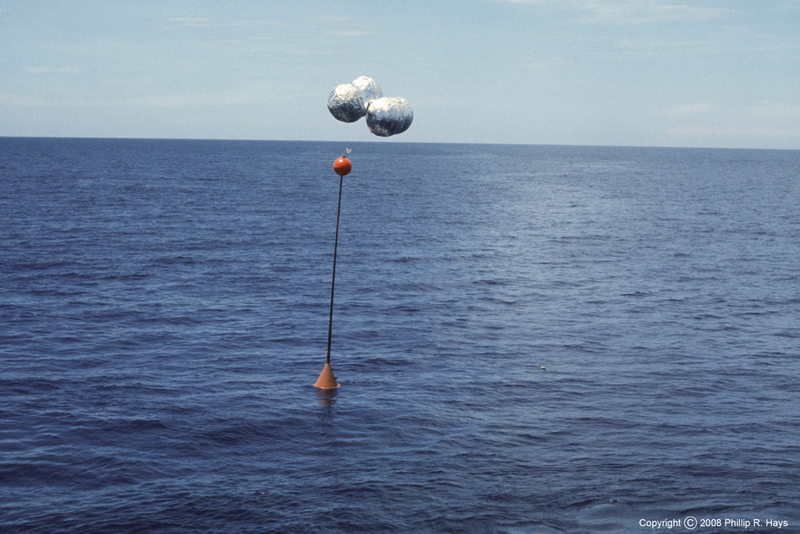 Notice the slightly larger diameter section of the buoy spar just below the orange sphere - we'll see it again. The rubber duck isn't standard test equipment, it was Ensign Herbert's idea (FM Division). He just liked the song "Rubber Ducky." With the target in the water we sailed over the horizon so we didn't have a line of sight to the buoy. 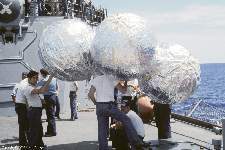 Another ship illuminated the balloons with a special transmitter to mimic the Russian radar. 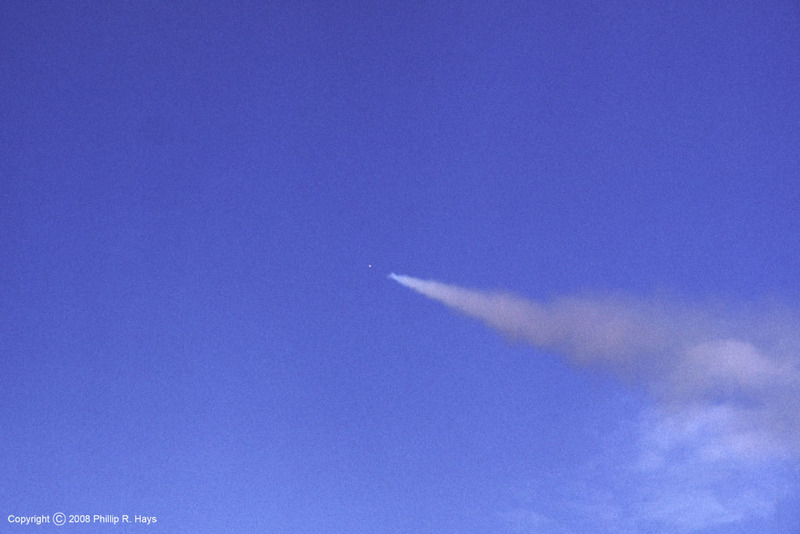 We fired a RIM-8H in the direction of the target and the missile homed in on the reflected signal. 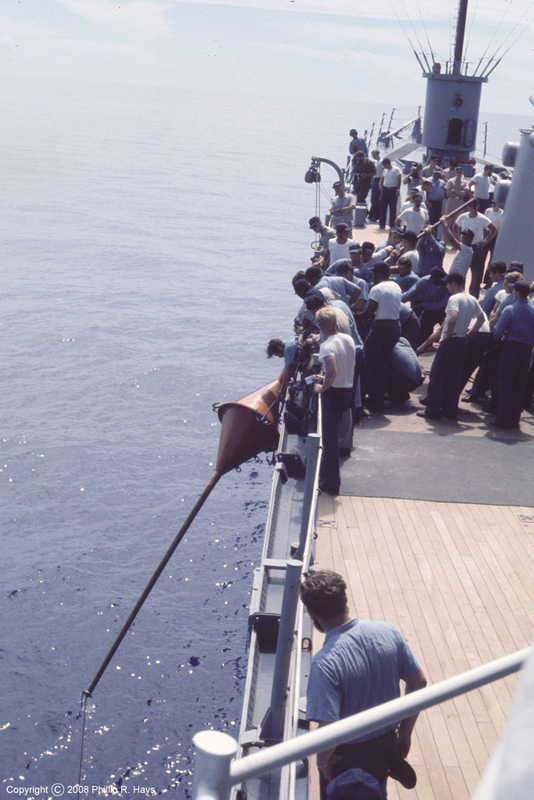 Then we steamed back to recover the buoy and the crew manhandled it aboard on the port bow. 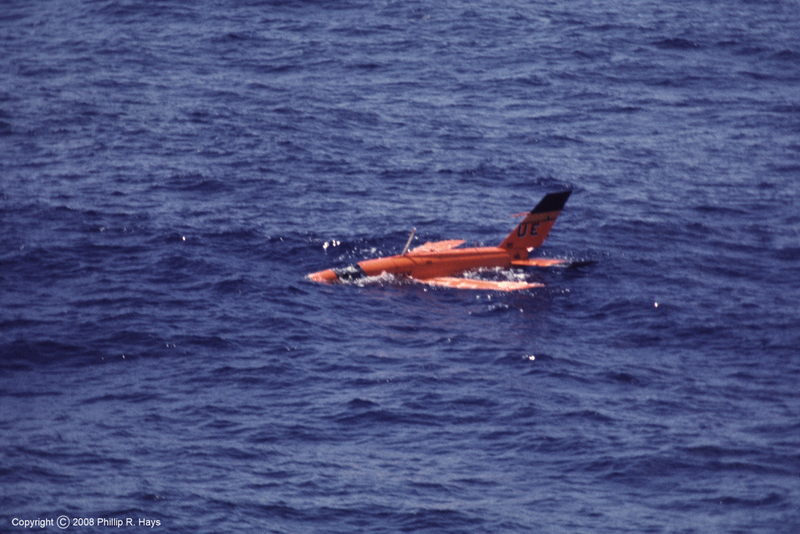 The spar was cut just about where the orange sphere had been attached. 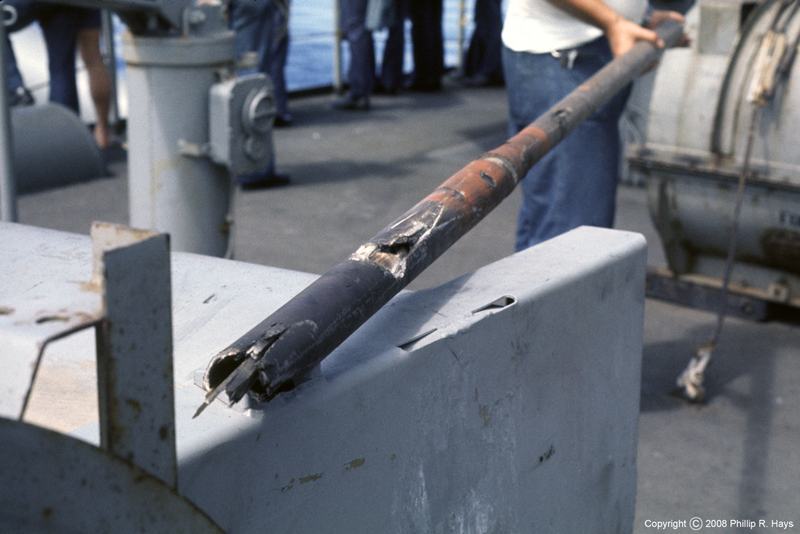 Notice the blackened larger diameter part of the spar and the gashes cut by contact with the missile. It was a direct hit! 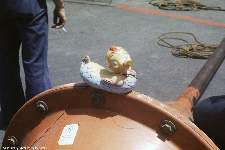 Unfortunately, we were unable to recover Mr. Herbert's rubber ducky. 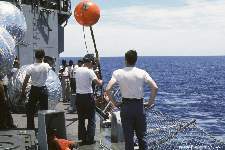 After this exercise we steamed into the Gulf of Tonkin and took station off the coast of North Vietnam near the NVN navy base at Vinh. 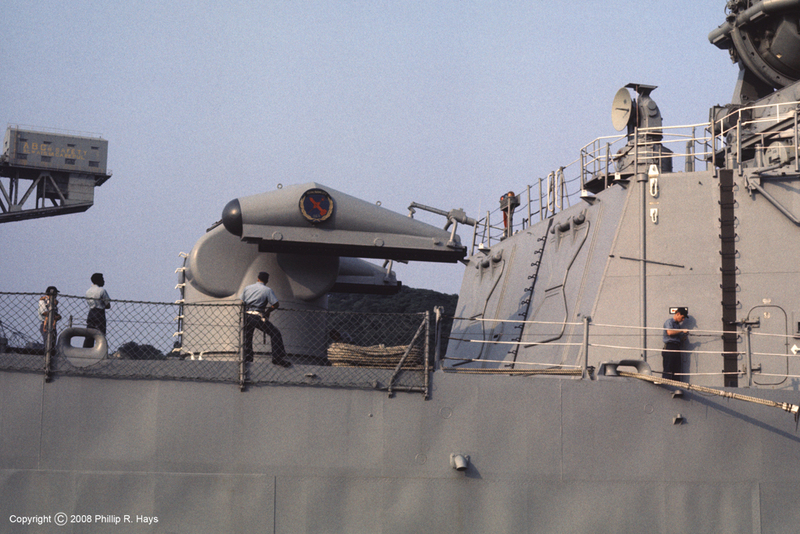 A few days later the NVN lit off a mobile radar truck and we got a chance to use the ARM missiles in combat. It was late at night, and I was the Duty Officer in Weapons Control. 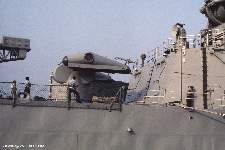 We fired one missile and destroyed the target. 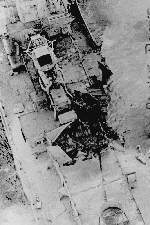 The next day reconnaissance photos showed a 30 foot diameter hole in the ground with pieces of the truck scattered around it. It was the first successful combat surface-to-surface missile shot in U.S. Navy history. 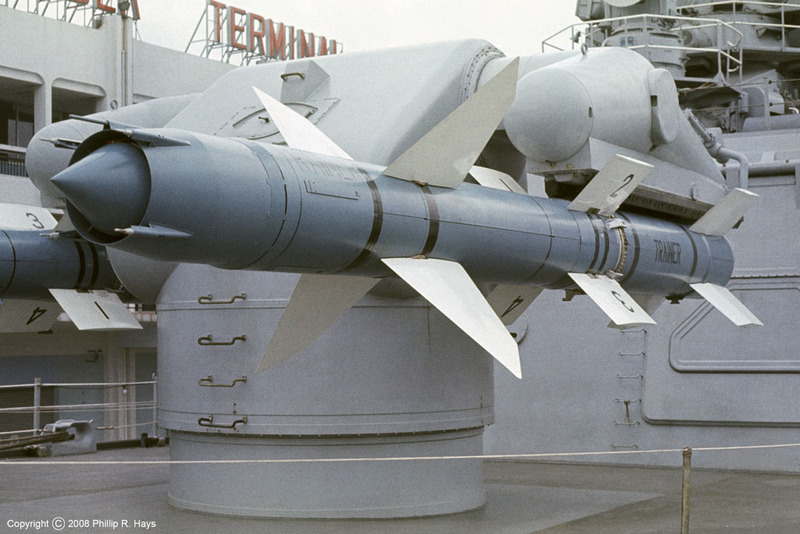 Talos was a large missile, about 20 feet long and just under 2 1/2 feet in diameter. 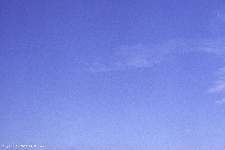 It was 1500 Kg (3300 lbs) of magnesium alloy airframe and aviation gasoline traveling at Mach 2.5 (1800 mph). 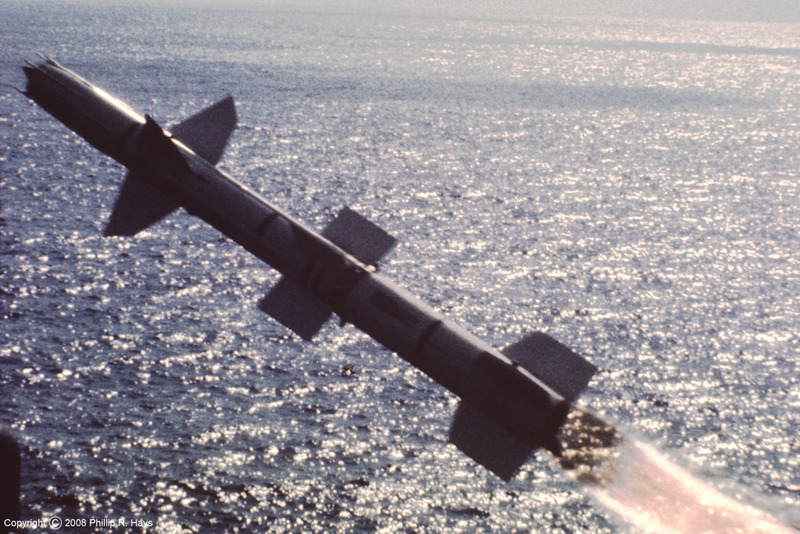 Even without a warhead it possessed enough kinetic energy to sink a ship. 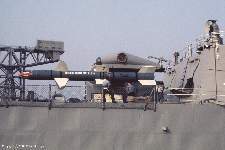 It gave the Okie Boat far more firepower and effective range than the guns of any battleship ever afloat. 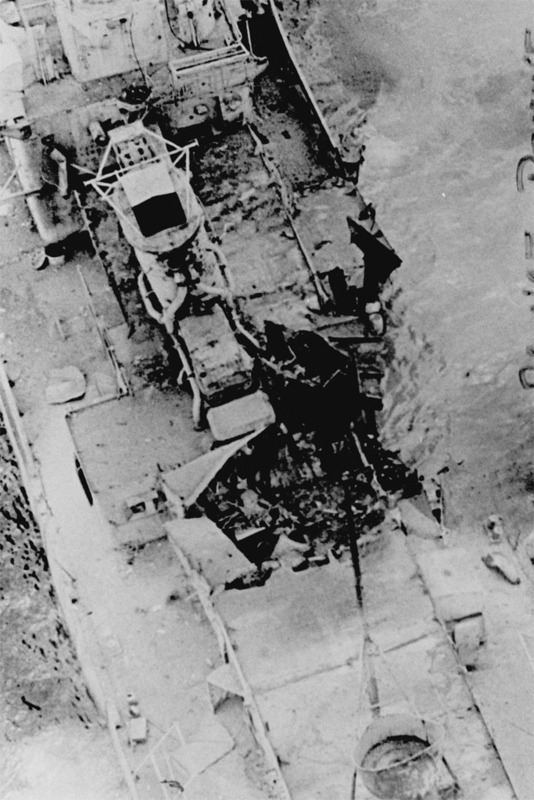 These pictures show the huge hole in the DE where the missile slashed through the ship. 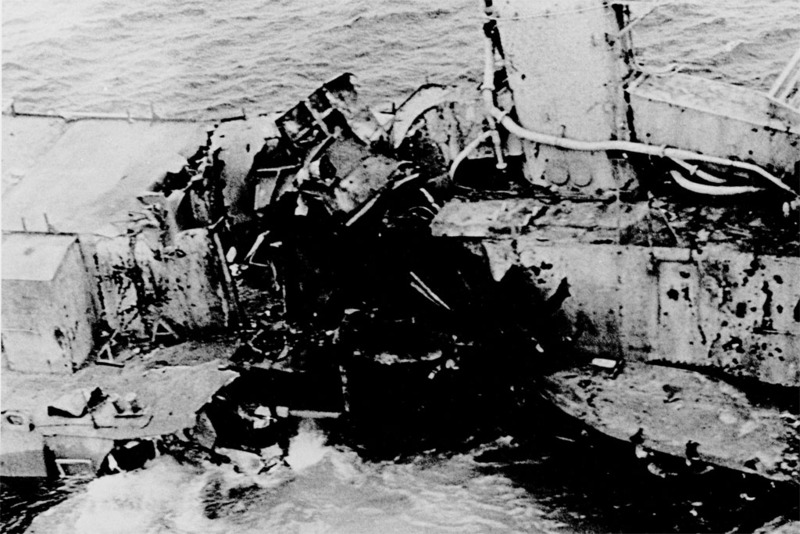 The missile came down almost vertically, striking amidships just aft of the funnel, exploding in the boiler room and engine room. 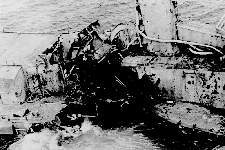 The explosion blew out a large wedge cutting through two thirds of the main deck and continuing through the bottom of the ship. 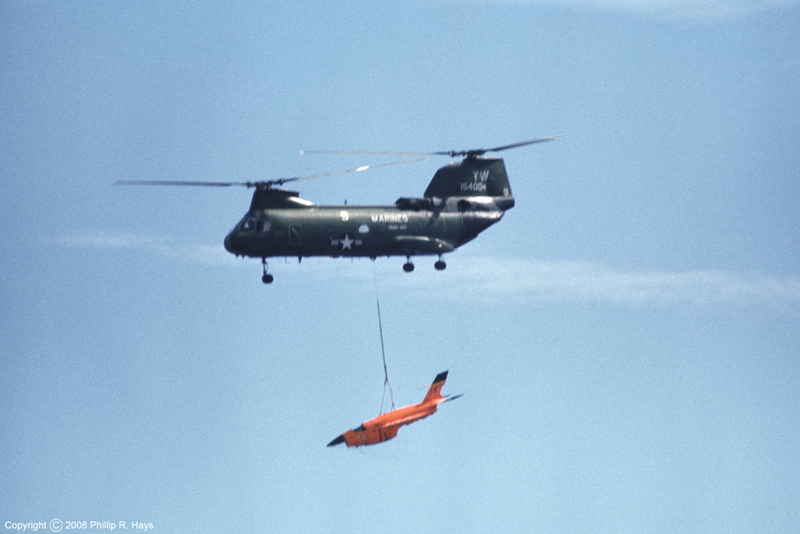 Imagine what it would have done if it had been carrying a live warhead with 102 Kg (225 lbs) of high explosives! 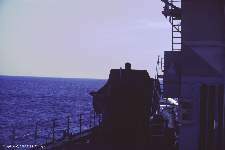 The only reason the ship remained afloat long enough to be photographed was because all water tight compartments were sealed. 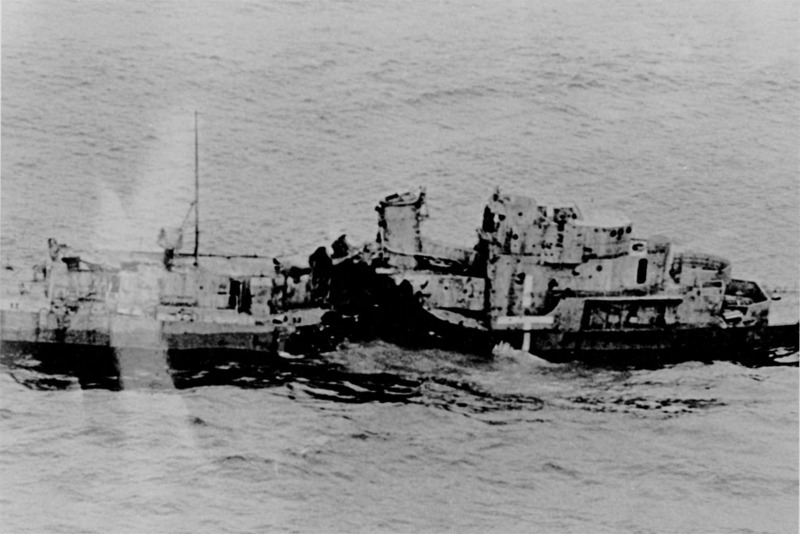 Even so, some of the crew who were aboard the OK City for the shot told me that the target ship broke in half shortly afterward and sank. Talos could also be fired at fixed surface targets up to 40 miles distant. A shipboard computer used the ship's position from our satellite navigation system to calculate the trajectory to the target location. 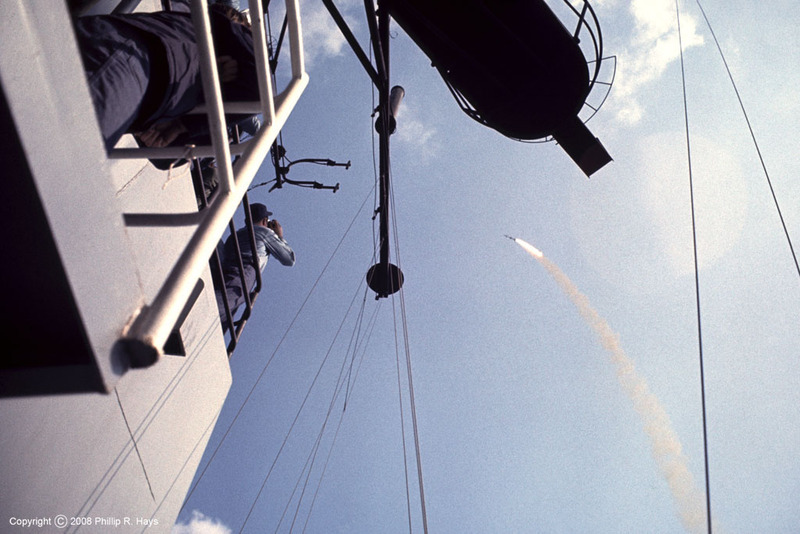 The missile was launched and guided to a position above the target, and then it would dive on the target. For these shots a nuclear warhead would have been used. 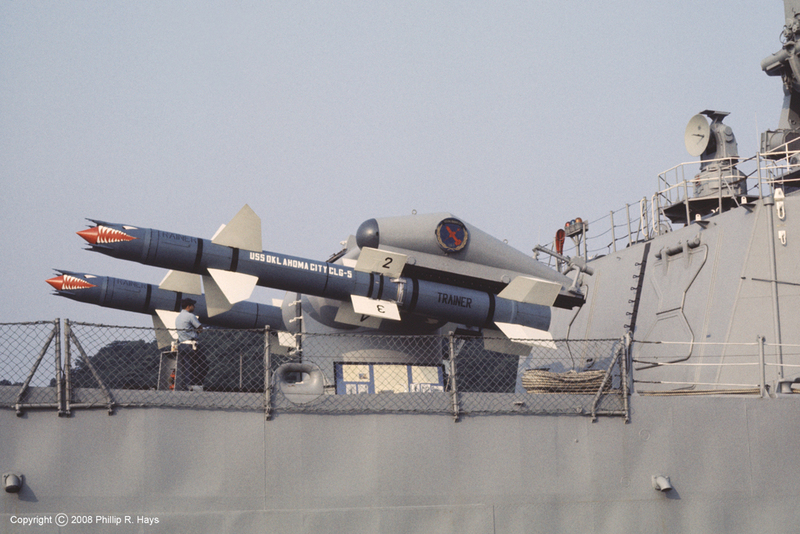 Talos missile system The Talos missile and launching system.